The boiling controversy concerning this album's direction between fellow Wu members resulted in one of the most anticipated releases of 2007, let alone the Wu-Tang Clan's entire discography. Curiosity had me drooling for this album months ahead of it's scheduled release. Honestly, with The RZA being accused of being a "hip-hop hippy" from his fellow Clan members was more intriguing. Which to me, meant a welcomed change in formula. While I can't say everyone on the roster is in TOP form. I will say The RZA is in top form. I also feel Method Man, Raekwon & Ghost are doing the best job overall. RZA's beats aren't that left field realistically. "Campfire" opens the album gorgeously, while "Take It Back" flexes a simpler, more atmospheric beat for the members to ride on. "Get Them Out Ya Way Pa" is one of my favorites, featuring dope verses from Meth. "Rushing Elephants" boasts a dope beat and holds solid. "Unpredictable" has some heart-stopping production - most definitely a standout. This one is exploding with energy and dope verses all around. "The Heart Gently Weeps" is a cover of The Beatle's "My Heart Gently Weeps" featuring John Frusciante on guitar & Erykah Badu on vocals. Compared to the advance of this tune I heard, this turned out to be a stunning track. "Wolves" is a solid joint here. Dope soundscape and tight lyrics from everyone. "Guns Will Go" is where it starts to get fuzzy for me. Though the lyrics are very dope, I'm simply not feeling the backing vocals by Sunny Valentine. Like the next track "Sunlight", it also slows down the mix...almost to a stop. This is a definite skipper to me. "Stick Me For My Riches" - too much singing. This is where the album stars to take a dive in my opinion. We are loosing that raw tag team style that makes the Wu so appealing. "Starter" also fails to boast a quality hook, let alone a worthwhile verse. "Windmill" saves the momentum a bit with a quality joint. "Weak Spot" & "Life Changes" close out the album pretty nicely. I can't really complain about those. Overall, this album is somewhat front-loaded with most of the quality cuts. It just starts to lose a little steam as it moves along. Realistically, GZA, Meth, Rae, Deck, Ghostface, and even U-God perform well throughout. Some sound more hungry and inspired by RZA's production choices than others. My main complaint is that there could have been less "pretty" hooks on this album. That's usually a trait that helps an album. But this is the Wu-Tang Clan. I'm not usually looking for elegant female choruses to spice up a winningly gritty East coast feel. RZA has gotten a lot of hype for the production of this album. However, I can't HEAR any reason why. Credit is due for the tribute to ODB track other than that the only other clean and hip beats come from the Wolves track. The flows seem a little to nice for Wu-Tangs hard east coast style. Maybe next time. Sooner than later too! they lived up to my expectations on this. 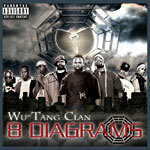 rza did an excellent job with the production and all members come at the top of their game. heart gently weeps is definitely the standout track with ghost's verse being one of the best i've heard in a long long time. the only weak spots are some of the hooks which get a little repetitive. overall i would give this a 4 outta 5.